Multi award-winning playwright John Godber’s club culture comedy, hailed as a social phenomenon and even one of National Theatre’s plays of the century, has now been yoinked from its original eighties setting and spewed back onto the piss-and-takeaway-slicked streets of austerity Britain. Bouncers Eric, Judd, Les and Ralph are back in front of the club for another night the same as any other across the decades, ribbing each other hard and spinning yarns of lads and lasses, sticky floors, shots galore and the shame-fuelled early morning Ubers home. Smoking ban aside, the dank low-rent club milieu remains queasily familiar, yet the time-shift does much more than enable a contemporary soundtrack and a few lowball swipes at social media and selfie culture. Threading through the societal impact of public spending cuts, the Me Too movement, third wave feminism and more, the show feels spiky and relevant while avoiding the heavy-handedness that can dog lesser writers attempting social commentary. At its core however – and likely one of the reasons for its longevity – it remains an absolute riot from start to finish. The script is one thing, but the cast of this upboot are a finely-tuned beast, the four bouncers they portray a solid jumping-off point for them to play an uncountable number of hilarious (and horrifically recognisable) other characters who make the seedy club their home. A whip-smart retooling of a classic script, deftly staged and propelled by a tireless, exceptional cast. 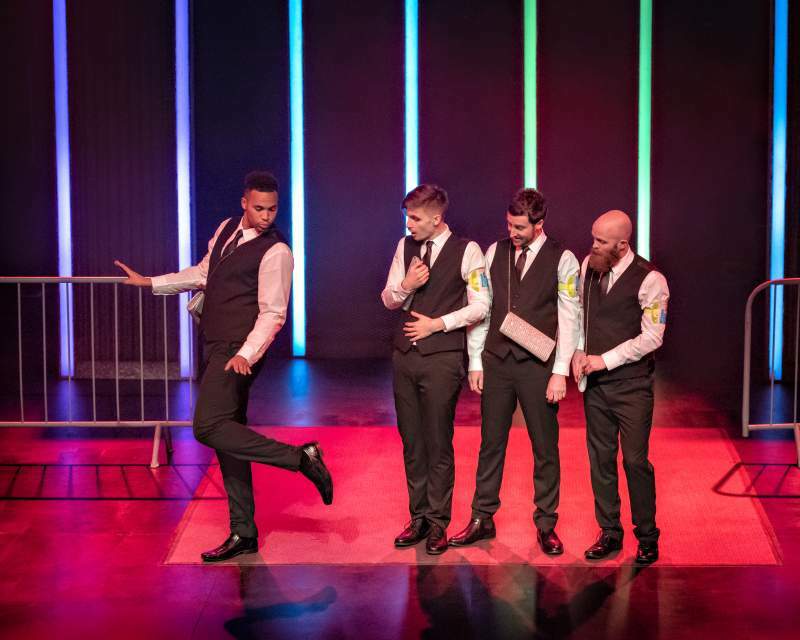 Bouncers is at Northern Stage, Newcastle until Saturday 23rd March.